When I was young, I spent my money on video games and baseball cards like so many kids. But perhaps, unlike other kids, I spent it on something else: stamps. From Sandra Day O'Connor to Colin Powell, I wrote an array of people I respected and looked up to. I'd ask them questions. Depending on the person, stuff like Did you always know what you wanted to be? What's the hardest pitch for you to hit? Did you know your actions would inspire a social movement? It was my first experience at interviewing—a very time consuming and old fashioned process that had to weather rain or shine. Sometimes, these prominent individuals answered my questions. Sometimes they simply sent me their autograph. And Ray Bradbury, he sent me holiday wishes. As a kid, I always admired Ray Bradbury—even before actually reading Bradbury. My mom was a huge Bradbury fan, and would talk about his books and short stories. My imagination ran wild with tales of tattoos coming to life and a society that burned books. When I finally read Mr. Bradbury, I was a fan, too. As a fan, who actually attempts to reach out, you are setting yourself for disappointment. But Bradbury did not. 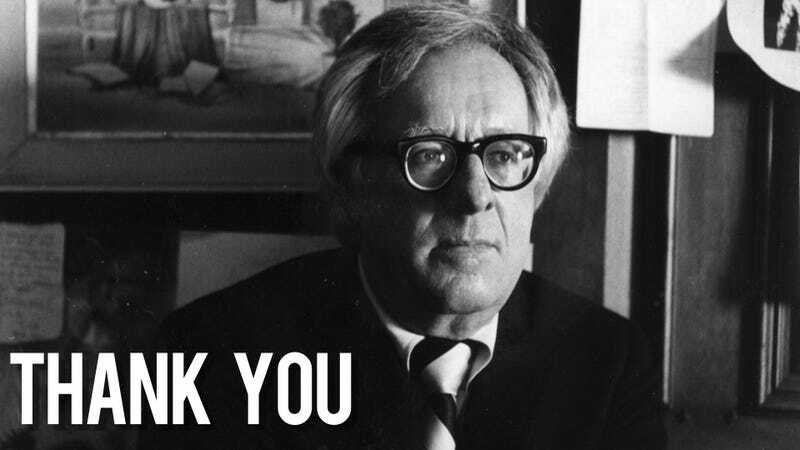 I never met Ray Bradbury—and he didn't have to reply to my letter. But he did and wished me a Happy 1994, in a note titled "A Christmas Wish 1993". This wasn't a wish, it was a present—his writings were also presents that people will be opening and discovering for decades to come. Honestly, I don't remember what I asked him, if anything. I might've said I enjoyed his books. Maybe I thanked him for his work. Maybe not. This week, Ray Bradbury passed away at the age of 91. With his passing, I can't help but feel that all this years later, I should've written him back, at least expressing my overdue gratitude for the gesture—a small one heaped on a career of large gestures and big ideas. This small one wasn't something he had to do, but he did anyway. Thank you, Mr. Bradbury, thank you. For everything.